If you hate the Chevy Volt the updates for 2013 won’t change your mind. If you are on the fence, however, Chevy has made some small but important improvements in the Volt. For 2013 Chevy has increased the Volt’s EPA estimated EV range from 35 miles to 38. Unlike most EPA estimates for hybrids the Volt’s appears to be pretty accurate. A leading consumer magazine found in their testing the Volt averages 35 miles city/highway running on pure battery power. In my experience, even in the cold Midwest winter months, the Volt still averaged about 32 EV miles on a full charge. 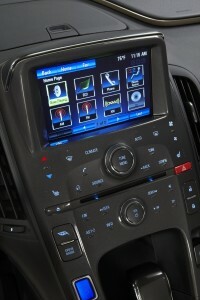 The main update for the 2013 Volt is the addition of the “Hold” mode. 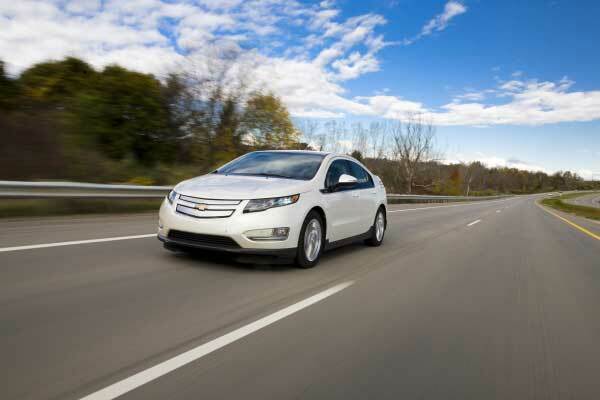 Before the 2013 model the Volt always drained the battery first before using the gas engine. What the Hold mode does is allow drivers to purposely use the gas engine even when the battery is fully charged. This update benefits people who drive both city and highway miles going to or from their destination. During the highway portion of the drive use the Hold mode so the relatively efficient gas engine powers the car. Then, during the city portion of the drive, switch to the battery. Its a simple, yet useful update. If you live in California or New York, the Volt now has a Low-emissions package (e-AT-PZEV) that makes it eligible for single-occupancy HOV-lane access. Living in the Midwest I don’t have much experience with HOV-lane access but if you often drive in congested traffic the Low-emissions package sounds like a nice option. Other Volt updates are more cosmetic in nature. The roof and liftgate color now match that of the car; previously they were always black. Pebble Beige cloth seats are available at no extra charge and Pebble Beige leather seats with suede inserts are available as an option. Also, a removable rear center armrest with storage is included in as part of the Premium Trim Package. Last of all, a new exterior color is available: Silver Topaz Metallic. Keyless access and ignition. This is a really nice option. With luck, you will never have to take your car-key out of your pocket or purse ever again. Remote vehicle starting system. Another handy option for very hot or cold temperatures. In addition to starting the car using the key fob, it can also be started using the free OnStar app available for most smart phones. The Volt comes standard with 3-years of OnStar coverage. Universal Home Remote – another name for a HomeLink type system. 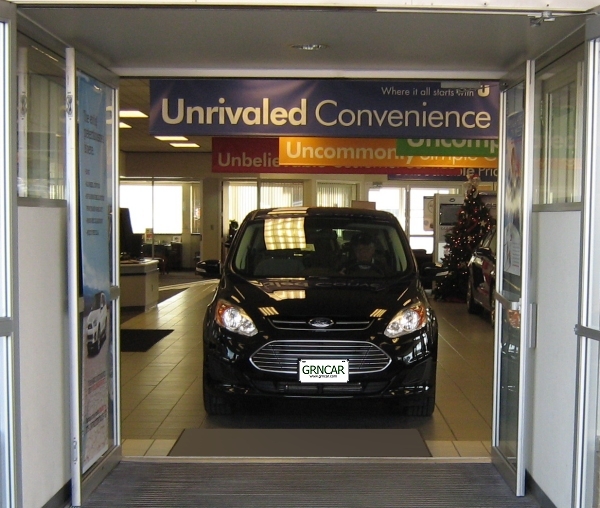 It allows you to program up to three garage doors independent of each other. Chevrolet MyLink. 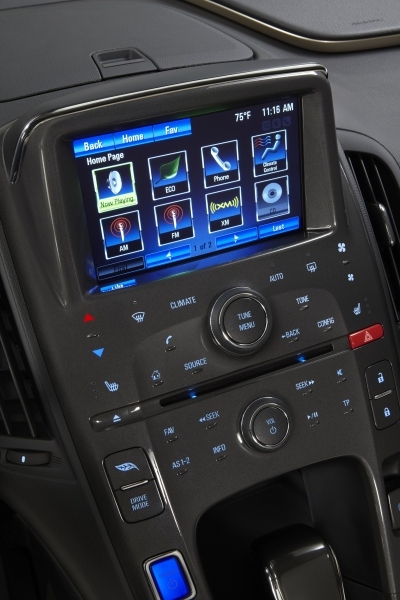 Similar to Ford’s SYNC system, MyLink allows voice activated control of Bluetooth paired phones as well as Bluetooth streaming audio such as Pandora and Stitcher with Gracenote (playlist and album art). A seven-inch Touch screen AM/FM stereo with CD player and MP3 playback. A three-month trial of SiriusXM Satellite Radio is also included. USB audio interface port for jump drives, iPhones, iTouches or other similar devices. New interior trim combinations include: Jet Black seat with Ceramic White accents, Jet Black seats with Dark accents, Jet Black and White seats with Ceramic White accents, Jet Black and Spice Red seats with Dark accents, and Pebble Beige seats with Dark accents. 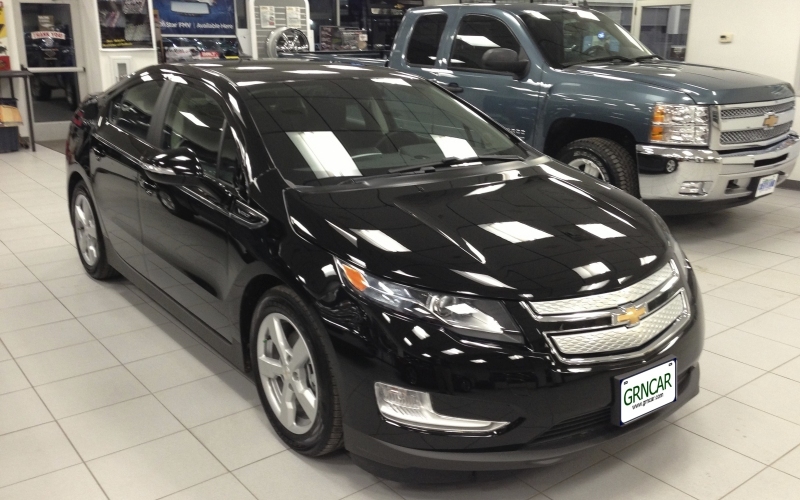 There are two option packages available for the Volt this year that I strongly recommend. The first is the Comfort Package; it is is a must have for colder climates. For $250 over the Volt’s base price it adds heated driver and front passenger cloth seats and a leather-wrapped steering wheel. The leather wrapped steering wheel is nice, but if you ever drive in cold weather the heated seats are fantastic. One of the optional settings on the Volt is to have the heated seats turn on automatically as soon as the car is started so you don’t have to even think about them. For the record, the passenger seat only heats if someone is sitting in it. The second option package worth having is Safety Package #1. For $575 it includes an auto-dimming inside rear view mirror, rear park assist and rear view camera. The auto dimming mirror is nice – it takes some getting used to – but what Chevy calls “rear park assist” is essential. Rear park assist is in essence a system that senses how close objects are to the rear bumper. If you get too close, an alert beeps. The closer you get to the object the more rapid the beeps. The rear view camera is nice, but I found that I quickly began to ignore it and instead relied on the side view mirrors and the beeps. Just like last year’s model, this year’s Volt drives and handles very well, especially in Sport mode. While Sport mode steals valuable EV power, it makes the car a lot of fun to drive – kind of an electric Camaro. Like the Camaro the Volt has virtually no body lean so cornering is a joy. Unlike the Camaro, the steering is a little numb – no feedback to speak of – but it could be a lot worse… the Toyota Prius comes to mind. Also, the Volt has a surprisingly tight 18ft turning radius. The Prius has a slightly tighter turning radius, but you would never know it to drive one. The steering on the Volt is quick enough to make driving fun. Also, the Volt has decent acceleration – especially compared to other hybrids – thanks in large part to the 273ft-lbs of torque provided by the electric motor. As much fun as the Volt is to drive, it has several potential problems. The first problem is outside visibility, how much of a problem it is, is up to the individual driver. If you are used to driving a Prius, the Volt is no worse, except it doesn’t have a rear-windshield wiper. Another potential problem is the back seat. It only seats two people and, while fine for children, they are fairly tight for adults. The interior design of the Volt is unique to say the least. The gauges are okay, but provide more information than most drivers need. The good news is the speedometer is easy to read and the gauges you really care about (the amount of battery power and fuel) are easy to find and read. Just ignore the rest. The Volt center stack definitely takes some getting used to. At first glance it appears to be nothing more than a mass of tiny buttons and labels but at second glance… it is still a mass of tiny buttons and labels, however it looks really cool. The key to using the center stack is find the button you need and then, rather than pushing down, just place your finger over it and hold it there for a moment. Unlike the touch-screen the center stack is not pressure sensitive. The good news is a lot of time you don’t need need to mess with the center stack; just use the MyLink voice command system. The MyLink voice command system allows the driver to control many commonly used radio and phone options. It works well and most of the commands are fairly intuitive. If you want to call someone, simply say “Call” followed by their name. The system works with any Bluetooth phone that has been paired with it. Other voice commands aren’t quite as intuitive. For example, with Ford’s SYNC system if you want to use the radio, just say “radio” followed by the station frequency. With MyLink you say “tune” followed by “AM” or “FM” followed by the station frequency. Still, MyLink is a useful system and the voice recognition is excellent. Once I learned the commands, the system had no trouble following them. It doesn’t get much better than the Volt in terms of safety. The Volt received a 5-Star Overall Vehicle Score for safety from the National Highway Traffic Safety Administration and was a 2012 Top Safety Pick by the Insurance Institute for Highway Safety. The Volt has also proven to be a very reliable vehicle. 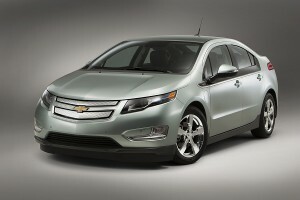 A leading consumer magazine has rated the Volt better than average for 2011 and 2012 while J.D. Power and Associates in their Initial Quality Study shows that Volt owners give it the 5 star rating for overall performance and design. The Initial Quality Study is taken after 90 days of ownership; it has been my experience that I always love a new car for the first 90 days so I never know how much weight to give these types of studies. Still, it does appear that Volt owners are very happy with their purchase. The Volt has solid competition from Nissan, Ford and Toyota. If you are comfortable with the range limitations of an all electric vehicle the 2013 Nissan Leaf is cheaper than the Volt, goes farther in pure EV mode and has better visibility. If a plug-in hybrid better suits your needs the Ford Fusion Energi and C-MAX Energi are worth a look, if you can find one… their availability is still very limited. The Fusion and C-MAX Energi don’t go as far in pure EV mode (slightly over 20 miles according to Ford) but they are cheaper and, especially in the case of the C-MAX, may be more practical. Note the Ford Fusion Energi and the C-MAX Energi are not eligible for the full $7,500 dollar federal tax credit, like the Plug-in Prius, they are only eligible for the $3,750 tax credit. The Toyota Plug-in Prius benefits from the legendary quality of the Prius, but with a range of only 11 miles in EV mode it hardly seems worth the extra expense when compared to a regular Prius. The Volt is in many ways a ground-breaking vehicle; the first of the plug-in hybrids. The Volt handles extremely well, has a nice solid ride and a decent amount of pep. It’s quiet and, if you have a commute of 30 miles or less, virtually eliminates stops at your local gas stations. If you don’t carry many passengers and don’t need a lot of luggage space the Volt makes a lot of sense especially when you add in the various government and state tax credits and dealer incentives.